We offer a range of massage treatments here at Utopia, including Pregnancy Massage suitable from 12 weeks right up until birth! Specialist Oncology Tranquil Sea Massage for those receiving cancer treatment - scroll down for more information. To view all massage treatments, please scroll down. Alternatively, CLICK HERE to view our luxurious massage spa rituals. Focusing on the deepest layers of muscle tissue, tendons and fascia (the protective layer surrounding muscles, bones and joints), Deep Tissue Massage is perfect for chronic aches and pain and contracted areas such as a stiff neck and upper back, low back pain, leg muscle tightness, and sore shoulders. The ultimate hot and cool stone massage. More beneficial than a conventional massage, the heated stones help to relax muscles, while the cool stones eliminate toxins from the body. Each stone has been carefully selected from South America for their healing properties. Massaged with the stones themselves, drift away in total bliss as stones are placed on the body's key energy channels for connection. Consisting of two water cushions heated to body temperature, the Hydrotherm massage is ten times more beneficial than a conventional massage. Utopia is the only salon in the area offering this highly beneficial massage service! Ten times more beneficial than a conventional massage, the Hydrotherm massage allows the client to lay face up throughout the entire treatment, eliminating the annoying stage of turning over halfway through a relaxing massage. As we only want the best for our clients, we only offer Hydrotherm massage services rather than conventional Swedish, so we know our clients will get the most comfortable, most beneficial treatment possible. Consisting of two water cushions heated to body temperature, the client is in constant contact with heat allowing the muscles to relax even before the treatment starts. The water ensures the body is kept in perfect spinal alignment, giving the client a more beneficial treatment, increasing the circulation and removal of toxins. The therapist slides their hands under, over and around the client's body in an uninterrupted motion using the client's own bodyweight as a source of pressure and water displacement instead of lifting the client. This treatment is especially good for heavily pregnant women and can be adapted for clients currently having, or recently having had, treatment for cancer. Therapists have been specially trained in these particular treatments and special insurance is in place allowing us to carry out these highly beneficial treatments. Focusing on the upper back, upper arms, shoulders, scalp and face, this treatment is ideal for those who suffer from migraines or sinus problems. An adapted massage for the Hydrotherm cushions to enhance benefits. 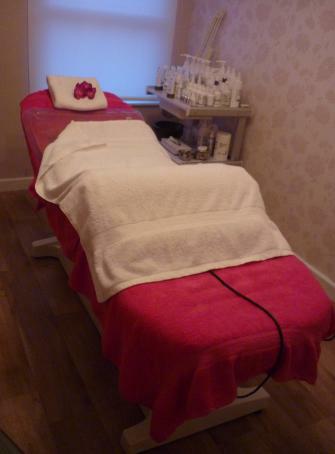 Utopia is currently the only salon in Abingdon offering massage services to pregnant women! The Hydrotherm treatment is adapted slightly for the pregnancy massage, and pregnant clients will never be expected to lay flat on their back. Please also note that this treatment is not suitable during the first 12 weeks of pregnancy. A consultation will be carried out prior to the massage to ensure a safe treatment. All Utopia therapists have received specialist advanced training in this area to enable us to offer this service. A safe, nurturing massage for those with cancer. Utopia was one of the very FIRST salons in the UK to have ALL therapist fully accredited and trained to offer this treatment! At a time when stress and anxiety can be at a peak, a short time spent having your body cared for and soothed by massage is a great relief. The Amethyst Trust has developed an accredited and endorsed treatment that can aid in relaxation throughout a client's cancer treatment and can be tailored to any person to ensure a comfortable massage experience.